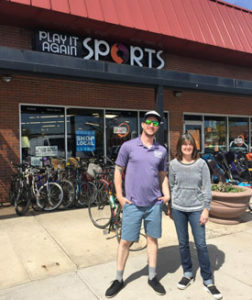 Housed between Murphy’s restaurant and Tuesday Morning at 653 South Broadway, owner Sue Stapleton started the business because she wanted to recycle good quality sports equipment. “Boulder is such a great place for this concept, everyone has a lot of equipment that is still in great shape and ready to pass on for a reasonable price,” Stapleton says. The business buys and sells new and used sports equipment, but also has services like bike repair, skate sharpening and ski tune-ups. Stapleton hears from parents who say their children wouldn’t have been able to participate in a sport without the option of used equipment. She also enjoys stories about people trying new sports with equipment purchased from the store. One of Stapleton’s favorite memories is when she helped a dog owner try out a treadmill to help exercise her four-legged friend. Sure enough, the customer bought the treadmill for her dog. The Table Mesa Shopping Center is a great location for Play it Again Sports because the variety of merchants always brings in new customers. Sometimes those customers stop by just to have a good time, “Our location next to Murphy’s allows many parents to go sit down to eat and send their kids over so we can entertain them while they enjoy dinner,” Stapleton says. Next time someone in your life is looking to take on a new sport, check out Play it Again Sports in the Table Mesa Shopping Center. 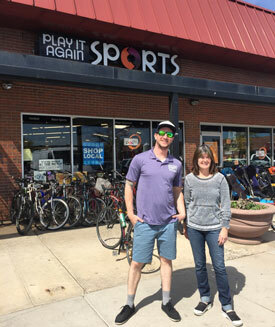 With an owner who has devoted her life to helping others get active in an affordable way, Play it Again Sports has become a staple in South Boulder.